Adnan al-Sahrawi is the U.S.-designated leader of the ISIS-affiliated Islamic State in the Greater Sahara (ISGS).“State Department Terrorist Designations of ISIS in the Greater Sahara (ISIS-GS) and Adnan Abu Walid al-Sahrawi,” U.S. Department of State, May 16, 2018, https://www.state.gov/r/pa/prs/ps/2018/05/282168.htm. He was the former senior spokesman for and self-proclaimed emir (leader) of the Sahara-based, al-Qaeda-linked group al-Mourabitoun (“The Sentinels”).Associated Press, “Sahara’s al-Mourabitoun pledges allegiance to Islamic State: report,” New York Times, May 14, 2015, http://www.nytimes.com/aponline/2015/05/14/world/middleeast/ap-ml-north-africa-islamic-state.html. In May of 2015, Sahrawi pledged al-Mourabitoun’s allegiance to ISIS and its caliph, Abu Bakr al-Baghdadi, urging “other jihadi groups to do likewise.”Associated Press, “Sahara’s al-Mourabitoun pledges allegiance to Islamic State: report,” New York Times, May 14, 2015, http://www.nytimes.com/aponline/2015/05/14/world/middleeast/ap-ml-north-africa-islamic-state.html. Sahrawi then split from al-Mourabitoun to form ISGS.Thomas Joscelyn and Caleb Weiss, “Islamic State recognizes oath of allegiance from jihadists in Mali,” Long War Journal, October 31, 2016, https://www.longwarjournal.org/archives/2016/10/islamic-state-recognizes-oath-of-allegiance-from-jihadists-in-west-africa.php; “Ambush of US forces in Niger reveals rise of jihadist splinter groups,” France24, October 19, 2017, http://www.france24.com/en/20171019-jihadist-ambush-usa-forces-niger-danger-sahel-islamic-state-jihadi-terrorism. Sahrawi is a member of the Sahrawi people, who are spread across southern Morocco, Mauritania, and parts of Algeria.“Ambush of US forces in Niger reveals rise of jihadist splinter groups,” France24, October 19, 2017, http://www.france24.com/en/20171019-jihadist-ambush-usa-forces-niger-danger-sahel-islamic-state-jihadi-terrorism. He is the former spokesman of Mali’s Movement for Unity and Jihad in West Africa (MUJAO), formed in 2011 as an offshoot of al-Qaeda in the Islamic Maghreb (AQIM). In August 2013, MUJAO merged with Moktar Belmokhtar’s al-Mulathamun (“The Masked Men”) Battalion—another AQIM offshoot—to form al-Mourabitoun. The group released a statement that the region’s jihadist movement is “stronger than ever,” and al-Mourabitoun would “rout” France and its allies in the region.“Belmohktar’s militants ‘merge’ with Mali’s Mujao,” BBC News, August 22, 2013, http://www.bbc.com/news/world-us-canada-23796920; “Sahara jihadist groups merge, threaten French interests – report,” Reuters, August 22, 2013, http://www.reuters.com/article/2013/08/22/northafrica-islamists-idUSL6N0GN2OQ20130822. Also in May of 2015, Sahrawi issued a statement addressed to the Romanian government, one month after his group abducted Romanian national Iulian Ghergut in Burkina Faso. Sahrawi stated that the life of Ghergut, who was seized while working for the Tambao manganese mining project near the Malian border, was entirely in the hands of the government of Romania.“Islamist group says holding Romanian hostage seized in Burkina,” Reuters, May 19, 2015, http://ca.reuters.com/article/topNews/idCAKBN0O41GF20150519. In a video dated November 3, 2016, Ghergut begged the Romanian government to negotiate with AQIM to secure his release.“AQIM releases video of Romanian hostage in Burkina Faso,” IHS Jane’s Terrorism Watch Report, November 3, 2016, http://www.janes.com/article/65239/aqim-releases-video-of-romanian-hostage-in-burkina-faso. In April 2015, al-Mourabitoun abducted Romanian national Iulian Ghergut in Burkina Faso while he was working for the Tambao manganese mining project near the Malian border. A month later, Sahrawi issued a statement on behalf of al-Mourabitoun to the Romanian government that Ghergut’s life was entirely in the hands of the Romanian government.“Islamist group says holding Romanian hostage seized in Burkina,” Reuters, May 19, 2015, http://ca.reuters.com/article/topNews/idCAKBN0O41GF20150519. Also in May 2015, Sahrawi declared al-Mourabitoun’s allegiance to ISIS. Belmokhtar dismissed the pledge, however, and maintained the group’s allegiance to AQIM.“Sahara Islamist leader Belmokhtar dismisses Islamic State pledge: report,” Reuters, May 17, 2015, http://www.reuters.com/article/us-sahara-militants/sahara-islamist-leader-belmokhtar-dismisses-islamic-state-pledge-report-idUSKBN0O20R020150517. 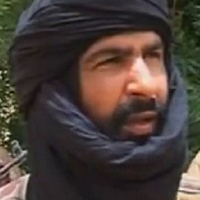 Belmokhtar reportedly stated that Sahrawi “was not elected by the Shura Council of al-Mourabitoun. He declared himself ‘Emir.’”Ashitha Nagesh, “Mali attack: Al Mourabitoun has claimed responsibility, but who are they?” Metro, November 21, 2015, http://metro.co.uk/2015/11/21/mali-attack-al-mourabitoun-has-claimed-responsibility-but-who-are-they-5516613/. There have been some reports that Sahrawi was speaking on behalf of MUJAO, not al-Mourabitoun.Thomas Joscelyn, “Confusion surrounds West African jihadists’ loyalty to Islamic State,” Long War Journal, May 14, 2015, https://www.longwarjournal.org/archives/2015/05/confusion-surrounds-west-african-jihadists-loyalty-to-islamic-state.php. According to U.S. officials, Belmokhtar’s followers attempted to assassinate Sahrawi after the latter’s pledge to ISIS.Caleb Weiss, “Islamic State’s Sahara branch claims first attack in Burkina Faso,” Long War Journal, September 4, 2016, http://www.longwarjournal.org/archives/2016/09/islamic-states-sahara-branch-claims-attack-in-burkina-faso.php. After the fallout with Belmokhtar, Sahrawi left al-Mourabitoun to create ISIS’s affiliate in the Sahara, ISGS.Thomas Joscelyn and Caleb Weiss, “Islamic State recognizes oath of allegiance from jihadists in Mali,” Long War Journal, October 31, 2016, https://www.longwarjournal.org/archives/2016/10/islamic-state-recognizes-oath-of-allegiance-from-jihadists-in-west-africa.php. One year later, in May of 2016, a man claiming to be Sahrawi released an audio message calling for attacks on Morocco’s Western tourists, Moroccan security, the United Nations mission in the Western Sahara, and on foreign companies.Thomas Joscelyn and Caleb Weiss, “Report: Head of the Islamic State’s Sahara branch threatens Morocco,” Long War Journal, May 6, 2016, http://www.longwarjournal.org/archives/2016/05/report-head-of-the-islamic-states-sahara-branch-threatens-morocco.php. In September of 2016, Sahrawi claimed credit on behalf of ISIS for an attack in Burkina Faso that killed two people.Caleb Weiss, “Islamic State’s Sahara branch claims first attack in Burkina Faso,” Long War Journal, September 4, 2016, http://www.longwarjournal.org/archives/2016/09/islamic-states-sahara-branch-claims-attack-in-burkina-faso.php. ISIS’s first public recognition of Sahrawi’s pledge came on October 30, 2016, with a post on Telegram in Arabic by ISIS’s Amaq News Agency.“Mali: 1st ‘official’ announcement by Amaq that segment of al-Mourabitoune (MUJAO) led by Adnan Abu Walid al-Sahrawi joined ‘Islamic State’,” Live UAMap, October 30, 2016, http://isis.liveuamap.com/en/2016/30-october-mali-1st-official-announcement-by-amaq-that-segment. ISIS referred to Sahrawi’s group as its battalion in Mali.Thomas Joscelyn and Caleb Weiss, “Islamic State recognizes oath of allegiance from jihadists in Mali,” Long War Journal, October 31, 2016, http://www.longwarjournal.org/archives/2016/10/islamic-state-recognizes-oath-of-allegiance-from-jihadists-in-west-africa.php. The post was accompanied by a short video clip of Sahrawi’s pledge.Tiemoko Diallo, “French air strikes kill wanted Islamist militant ‘Red Beard’ in Mali,” Reuters, March 14, 2014, http://www.reuters.com/article/2014/03/14/us-mali-islamists-idUSBREA2D13Z20140314. The ISGS reportedly includes members of the Peul ethnic group from the Mali-Niger border region. Sahrawi and the ISGS have reportedly carried out several attacks on military targets in Niger.“Ambush of US forces in Niger reveals rise of jihadist splinter groups,” France24, October 19, 2017, http://www.france24.com/en/20171019-jihadist-ambush-usa-forces-niger-danger-sahel-islamic-state-jihadi-terrorism. Authorities suspected the ISGS of carrying out the October 4, 2017, ambush of U.S. soldiers near Tongo Tongo, Niger, close to the Mali-Niger border. The attack killed four U.S. soldiers and four Nigerien soldiers.“Ambush of US forces in Niger reveals rise of jihadist splinter groups,” France24, October 19, 2017, http://www.france24.com/en/20171019-jihadist-ambush-usa-forces-niger-danger-sahel-islamic-state-jihadi-terrorism. Sahrawi claimed responsibility on behalf of ISGS in January 2018.“CORRECTED-Islamic State affiliate claims deadly attack on U.S. troops in Niger,” Reuters, January 13, 2018, https://af.reuters.com/article/africaTech/idAFL8N1P80EK. According to Ibrahim Maiga of the Institute for Security Studies in Bamako, Mali, Sahrawi has succeeded in “creating links with local people despite the fact that he is a stranger to the area.”“Ambush of US forces in Niger reveals rise of jihadist splinter groups,” France24, October 19, 2017, http://www.france24.com/en/20171019-jihadist-ambush-usa-forces-niger-danger-sahel-islamic-state-jihadi-terrorism. Sahrawi’s whereabouts remain unknown, but the ISGS is primarily based in Mali.“Ambush of US forces in Niger reveals rise of jihadist splinter groups,” France24, October 19, 2017, http://www.france24.com/en/20171019-jihadist-ambush-usa-forces-niger-danger-sahel-islamic-state-jihadi-terrorism. The U.S. government sanctioned Sahrawi and ISGS in May 2018.“State Department Terrorist Designations of ISIS in the Greater Sahara (ISIS-GS) and Adnan Abu Walid al-Sahrawi,” U.S. Department of State, May 16, 2018, https://www.state.gov/r/pa/prs/ps/2018/05/282168.htm. Abou Walid SahraouiTiemoko Diallo, “French air strikes kill wanted Islamist militant 'Red Beard' in Mali,” Reuters, March 14, 2014, http://www.reuters.com/article/us-mali-islamists/french-air-strikes-kill-wanted-islamist-militant-red-beard-in-mali-idUSBREA2D13Z20140314. Abu Waleed al-SahraouiJason Burke and Julian Borger, “US special forces ‘fought Niger ambush alone after local troops fled,’” Guardian (London), November 4, 2017, https://www.theguardian.com/world/2017/nov/04/special-forces-unit-ambushed-in-niger-desperately-called-for-help-sources-say. Abu Walid al Sahrawi“Counter Terrorism Designations and Designation Update,” U.S. Department of the Treasury, May 16, 2018, https://www.treasury.gov/resource-center/sanctions/OFAC-Enforcement/Pages/20180516.aspx. Abu Walid Sahraoui“Al-Mourabitoune diffuse une vidéo montrant l'otage roumain I. Ghergut,” Dwekh Nawsha france, September 1, 2015, http://www.dwekh-nawsha-france.com/al-mourabitoune-diffuse-une-video-montrant-lotage-roumain-i-ghergut/. Abu Walid al-SahraouiRukmini Callimachi, “Militant Group Says It Has Romanian Hostage,” New York Times, May 18, 2015, http://www.nytimes.com/2015/05/19/world/middleeast/militant-group-says-it-has-romanian-hostage.html?_r=0. Adnan Abu Waleed al-SahrawiThomas Joscelyn and Caleb Weiss, “Report: Head of the Islamic State’s Sahara branch threatens Morocco,” Long War Journal, May 6, 2016, http://www.longwarjournal.org/archives/2016/05/report-head-of-the-islamic-states-sahara-branch-threatens-morocco.php. Adnan Abu Walid“Ambush of US forces in Niger reveals rise of jihadist splinter groups,” France24, October 19, 2017, http://www.france24.com/en/20171019-jihadist-ambush-usa-forces-niger-danger-sahel-islamic-state-jihadi-terrorism. Adnan Abu Walid al-Sahraoui“Counter Terrorism Designations and Designation Update,” U.S. Department of the Treasury, May 16, 2018, https://www.treasury.gov/resource-center/sanctions/OFAC-Enforcement/Pages/20180516.aspx. Adnan Abu Walid al-Sahrawi“Sahara Extremists Pledge Allegiance to Islamic State Group,” Reuters, May 14, 2015, http://af.reuters.com/article/topNews/idAFKBN0NZ1E820150514. Lehbib Ould Ali Ould Said Ould JoumaniAli Hader, “A Daech-affiliated Polisario militiaman making threats against Morocco,” Sahara News, May 9, 2016, http://sahara-news.org/1342-a-daech-affiliated-polisario-militiaman-making-threats-against-morocco.html. The U.S. government sanctioned Adnan Abu Walid al-Sahrawi as a Specially Designated Global Terrorist on May 16, 2018.“State Department Terrorist Designations of ISIS in the Greater Sahara (ISIS-GS) and Adnan Abu Walid al-Sahrawi,” U.S. Department of State, May 16, 2018, https://www.state.gov/r/pa/prs/ps/2018/05/282168.htm. The U.N. Security Council designated Adnan Abu Walid al-Sahrawi as being associated with ISIL or Al-Qaida for on August 9, 2018.“QDi.415ADNAN ABOU WALID AL-SAHRAOUI,” United Nations Security Council, August 9, 2018, https://www.un.org/sc/suborg/en/sanctions/1267/aq_sanctions_list/summaries/individual/adnan-abou-walid-al-sahraoui. Adnan al-Sahrawi was the former senior spokesman for and self-proclaimed emir (leader) of the Sahara-based, al-Qaeda-linked group al-Mourabitoun (“The Sentinels”). "The combat will continue until victory, thanks to God’s protection. The mujahedeen are in the city of Gao and will remain there.”David Axe, “'NOW WHAT? ': AS FRANCE LEAVES MALI, THE WEST'S NEW WAR STRATEGY SHOWS PERIL,” Wired, February 14, 2013, https://www.wired.com/2013/02/mali-peril/. “We claim today's attack against the Malian soldiers who chose the side of the miscreants, the enemies of Islam.”“Mali hit by first suicide bombing,” Reuters, February 9, 2013, http://www.aljazeera.com/news/africa/2013/02/20132942121755772.html. “Attacks on the enemies of Islam will continue.”“Suspected Islamists in Mali blow up bridge near Gao,” France24, October 8, 2010, http://www.france24.com/en/20131008-mali-suspected-islamists-blow-bridge-gao. Offering terms to the Romanian government on the release of a Romanian man kidnapped the month prior: “The Romanian government will be entirely responsible for the fate of the hostage if it does not take the opportunity given to free its citizen.”“Islamist group says holding Romanian hostage seized in Burkina,” Reuters, May 19, 2015, http://ca.reuters.com/article/topNews/idCAKBN0O41GF20150519. Pledging al-Mourabitoun’s allegiance to ISIS and its self-appointed caliph Abu Bakr al-Baghdadi: “We call upon all the jihadi groups to pledge allegiance to the Caliph, to unify the word of the Muslims and align the ranks in front of the enemies of religion.”Associated Press, “Sahara Extremists Pledge Allegiance to Islamic State Group,” New York Times, May 14, 2015, http://www.nytimes.com/aponline/2015/05/14/world/middleeast/ap-ml-north-africa-islamic-state.html.